Nestled between Clinton Hill and Downtown Brooklyn, Fort Greene has an array of restaurants, shopping options and even the borough’s first park, the namesake Fort Greene Park. History, dating to the 1700s, lines the streets of this neighborhood, named for a Revolutionary War general and fort. I in 1978, the New York City Landmarks Preservation Commission named part of Fort Greene a Historic District. Fort Greene is also home to the Williamsburgh Savings Bank at One Hanson Place, which was once the tallest building in Brooklyn at 512 feet high. One of the borough's oldest financial institutions, it was built between 1927 and '29 and designated as a New York City landmark in 1977, followed by its interior in 1996. Close to Atlantic Terminal, you have your choice of trains (and even the Long Island Rail Road) to take you to Fort Greene. Here, our picks for spending a day in this historic neighborhood. 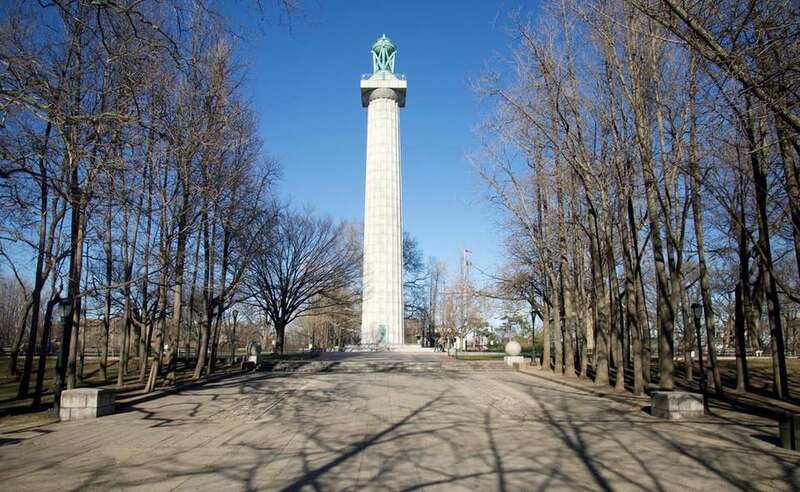 It's no coincidence that Fort Greene Park is located within the Fort Greene Historic District of Brooklyn: The 30-acre space dates back to Revolutionary War days. In addition to being a picnic spot, urbanites head to the Frederick Law Olmsted and Calvert Vaux-designed park for its history. Visit the Prison Ship Martyrs Monument, shown, which towers 149 feet above the park and is topped with a 20-foot bronze urn; it honors the 11,500 captives who died on British prison ships in nearby Wallabout Bay during the war. Opened by designer Matthew Maddy and chef Tyler Kord in 2008, this restaurant, named after its 7 Greene Ave. address, serves up some of the best broccoli dishes around. Why? Because the chef loves it, Katherine Pangaro, chief operations officer, says. In fact, Kord wrote the book on it: "Broccoli" details recipes for incorporating more of the cruciferous veggie into your life. Pangaro notes that the broccoli tacos are a popular menu item; we're talking about double-decker tacos, shown, served with feta, fried shallots and black bean hummus. Another fan favorite, she says, is the fried chicken sandwich, which is served with a spicy maple sauce. You'll find No. 7 outposts beyond Fort Greene, too, including No. 7 North bar in Greenpoint. There are few spaces in the city where you can admire art, purchase jewelry and take classes to learn the ins and outs of glassmaking. Founded as the New York Experimental Glass Workshop in 1977 by Erik Erikson, Richard Yelle and Joe Upham on Great Jones Street in Manhattan, the current Fort Greene UrbanGlass is a go-to spot for anyone even remotely interested in learning more about glass art. It houses studios as well as the Agnes Varis Art Center, with a gallery and retail store. At 647 Fulton St., tour the studios on Saturdays at 1 p.m. for free, or take a class in glassblowing, flameworking, neon lighting or stained glass. Get lost in literature at Greenlight Bookstore, an independent shop owned by booksellers Rebecca Fitting and Jessica Stockton Bagnulo. In business since 2009, Greenlight has since expanded from one store on 686 Fulton St. in Fort Greene to another location at 632 Flatbush Ave. in Prospect Lefferts Gardens that opened last fall. "For every $100 you spend at an independently owned business, $68 will stay in the community," its website states. If you feel so inclined, join the First Editions Club to receive an autographed first edition of a new, hardcover fiction book each month. It costs a penny to subscribe and each month your card will be charged for the list price of the book, plus shipping costs. For an afternoon jolt, make your way to BitterSweet, 180 DeKalb Ave. Here you'll find a variety of La Colombe coffees, doughnuts from Dough, pastries from Choice Market, bread from Balthazar and sandwiches and baked goods made in house. From espresso drinks to a number of teas and cold beverages, it's an ideal spot for a recharge. Biggie Smalls murals are throughout the Brooklyn native's borough, and one of the best known -- of Notorious B.I.G. as a revolutionary, sporting a beret a la Che Guevara -- is at the corner of South Portland Avenue and Fulton Street in Fort Greene. Fresh roast pork, ham, Swiss cheese and pickle on hero bread with chipotle mayo: Those are the components of Habana To-Go's Cuban sandwich, considered by many to be one of the best in New York City. Queens native Sarah Hermina recalls her first time eating the Cuban at the spot on 757 Fulton St. "When I bit into it, the flavor was mesmerizing." Also don't leave this spot on the corner of Fulton and South Portland Avenue in the Brooklyn Love Building without trying the grilled corn served with mayonnaise, Cotija cheese, chili powder and lime. Fun fact: It's a spinoff of Cafe Habana in NoLita, opened by Sean Meenan in 1998. With a focus on social and political issues surrounding the African diaspora, MoCADA is "a collective effort of many different people," employee Giselle Buchanan says, At 80 Hanson Pl., you'll find a variety of exhibitions, educational opportunities and community programs; current exhibits include "Surrogate Skin: The Biology of Objects," shown, and on view through April 9. Every August, MoCADA's weeklong Soul of Brooklyn Festival features a performances, street fairs, workshops, film screenings and other events. Founded in 1999, "MoCADA really draws upon the community to keep it going and highlighting voices that are fresh and not necessarily what the greater narrative has to offer," Buchanan says. With nearly 20 German beers on tap and more than that served up via bottle, Die Stammkneipe, 710 Fulton St., will educate you about the difference between a hefeweizen and a pilsner. Make some new friends -- it's set up beer hall style with communal tables -- and if you need some food, well, you're covered there as well. Traditional eats include bratwurst and potato fritters. End your day on a high note by attending a concert, performance or screening at local institution the Brooklyn Academy of Music. Around for 156 years, the urban arts center is spread across three locations: the Peter Jay Sharp Building on Lafayette Avenue, show; BAM Harvey Theater on Fulton Street and BAM Fisher on Ashland Place. Nearby Atlantic Terminal provides convenient access.